The India-based startup Kaaya Tech is trying to create the ultimate in mixed reality wearables: a full-body HoloSuit with points of articulation that can accurately track the body in a variety of motions. Using pants, a jacket, and gloves, the HoloSuit can collect data about the way we move and create meaningful and accurate simulations. The suit is still in development, but a new application shows off what’s possible and what the company hopes that mixed reality can do for athletics. The HoloSuit is an amazing piece of technology that relies on wireless protocols to transfer and relay data, specifically Bluetooth. Bluetooth is frequently used in short-range transmissions because of its battery saving capabilities. The suit also benefits from a greater capability to interface with any device. In other words, not just the headset, but a handheld device like a phone too. Real-time statistics, anyone? The suit promises 8 hours of battery life, which is better than what TPCast is promising for its wireless option on the Vive. As a technology aficionado, I question the accuracy of this statement and would be anxious for some testing in the field to confirm how they’ve arrived at that measurement. I suspect that kind of battery life is for independent use of the suit, not paired with any kind of device. That said, the suit does appear to be shock free and sweat proof, suggesting that Kaaya wants this suit used in the real world as often as possible. The Golf game is part of a suite of trainer games that the company envisions its clients will use to train at certain athletics. Golf is an extremely demanding game, even if not physically demanding. It requires endurance, mental fortitude and the ability to maintain perfect form. Golf swings feel extremely awkward to the uninitiated (protip: that’s how you know you’re doing it right). HoloSuit Golf will track and visualize the movements in your swing. It will then offer some pointers on what you can do to correct inconsistencies and problems you may have developed over the years. At the moment, this is only stored in the cloud with automated suggestions available for users. The computer is “taught” to know what to look for and will urge you to meet those standards, but future simulations will incorporate specific trainers who will offer a more personalized approach to coaching your swing. Simply put, this is huge. Especially if you’re an amateur golfer looking to find your niche. Offering golf lessons to anyone in the world just became an option when both of you are wearing this suit. If you’re trying to improve your game, then HoloSuit offers an immersive means of practice with completely realistic feedback on ball physics. The suit can look at your motions and translate them into the virtual world, or even replay your day by tracking your motions on the course as you wore the suit. There are a few drawbacks to this suit in its current stage that go beyond the claims of battery life. The first is that it’s not a very attractive piece of kit. Gloves are one-size fits all and not as aesthetically pleasing as some of the other haptic suits we’ve seen. It does look pretty great with a Vader mask, and the company is offering different colors, but it needs a fashion designer touch to be a truly refined product. The kit also looks bulky, which isn’t a problem in climate controlled spaces. Outside of testing at a lab, how would the user avoid overheating? Shockproof or not, if my body can only handle an hour in the suit before I overheat, then I’m not sure I can collect meaningful data with it. However, we do have to offer some credit. This suit is attempting to track more than your average haptic suit and is still in its early design stages. It’s also incredibly affordable at $500 for the full kit, and it comes packaged with a small suite of applications you can test right now. Consider the tech: full motion tracking with cloud storage of your data and visualizations? 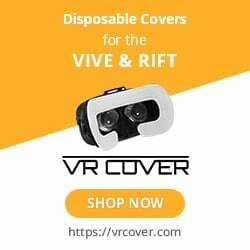 This is a new kind of VR experience on par with enterprise applications like STRIVR, only available now and at the consumer level. Will we see HoloSuits on the golf course this year? Perhaps. But we’re more likely to see them used privately in our homes. There’s a lot of ground to cover: from rendering individual courses so you can play anywhere in the world, to creating and connecting a network of professional trainers that will enhance the experience. Early work on the HoloSuit looks very promising. If the claims of battery life are true, and the suit gets a bit more refinement, this might be the killer mixed reality accessory of 2018.